Reversed: Trying one more time, indecision, aimless drifting, walking away. 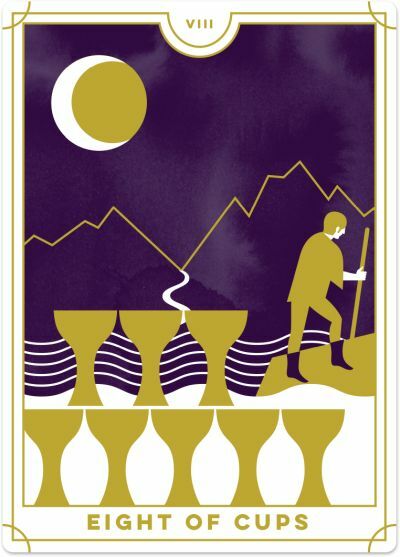 In the Eight of Cups, a man walks away from the eight cups standing in the foreground. The cups are arranged in such a way that it looks like one is missing, a sign that emotional fulfilment and wholeness is lacking. The man has turned his back on these cups with a sense of loss and disappointment and shuffles away into the mountains. A nearby river symbolises his emotions, and the mountains represent the awareness that this will not be an easy journey (though it will be necessary for true long-term happiness). The moon in the night’s sky illuminates the path ahead – the man is leaving in the dead of night hoping to go unnoticed, suggesting that there may be a level of escape or avoidance in this card. When the Eight of Cups shows up in a Tarot reading, you may feel compelled to walk away from a disappointing situation. It could mean turning your back on an unfulfilling relationship, job, career path, living arrangement or creative project that was once a source of great happiness to you but now only brings you pain. You have invested yourself emotionally but, despite your best efforts, are disappointed; it hasn’t turned out the way you had expected it to, and you realise that you are no longer getting anything out of this situation. Now, the only choice is to put it behind you and move on with your life, even if it brings you sadness as you say goodbye. The Eight of Cups suggests you sense that something is missing, particularly on an emotional or spiritual level, and instead of waiting around for things to get better, you know you need to leave that unfulfilling situation. It may not make sense to others because on the face, it looks as if you have everything you had wished for – but, deep down, you know it’s not serving your Highest Good, and it’s time for you to let it go and move on. The Eight of Cups can be a sign that you are trying to escape a problematic emotional situation or avoiding some major psychological issues and concerns. The Cups in the foreground represent emotional issues that remain real and present in your life. Yet you are trying to pretend as if they no longer exist, refusing to deal with them. You may repress your emotions or refuse to have open conversations with others about what’s happening, instead preferring to pretend as if everything is okay, or avoiding the scene altogether. The Eight of Cups invites you to ask yourself what brings you joy, contentment and fulfilment on a deeper level. Without it, you might pursue goals that fail to give you the satisfaction you’re seeking. For example, you may think being in a long-term relationship is what you want, but when you manifest it, you realise that it’s not just the long-term relationship you want but a deep soul connection with someone. If that’s not there, then the relationship will not fulfil your needs no matter how long you stay together. 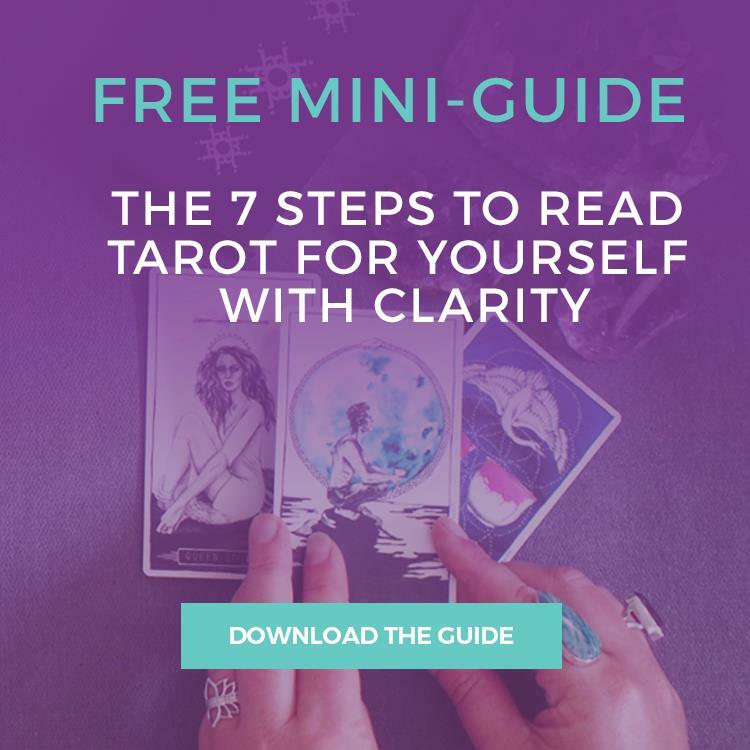 So, if you find yourself repeatedly in these Eight of Cups situations where you have no choice but to walk away, spend time exploring what will bring you true happiness and realign your goals with your values. The reversed Eight of Cups raises the question, “Do I stay or do I go?” You may be caught between walking away from a disappointing situation or trying one last time to make things better. But the real question is, 'Can the circumstances improve, or is it a lost cause?' Check in with your intuition to understand whether you should give this situation one more chance, or if you should release and let go. If the reversed Eight of Cups is paired with more passive cards such as the Hanged Man or the Four of Swords, then it may be a sign that you wish to try one more time. However, if this card couples with a more active card such as the Eight of Wands or Chariot, it may be time to move on and pursue a different path. The reversed Eight of Cups invites you to listen to your heart about your next course of action. Others may have an opinion, but it comes down to what’s important to you. Only you know whether this situation is serving you and if there is hope for the future. Be mindful of what you want and then check in to see if this move is in alignment with your goals and dreams. At times, the reversed Eight of Cups can show that you are drifting from one place to the next because you never feel satisfied with staying in one place. “The grass is always greener on the other side.” If this resonates, ask yourself what makes you happy and how you can design your life in alignment with your deepest contentment.